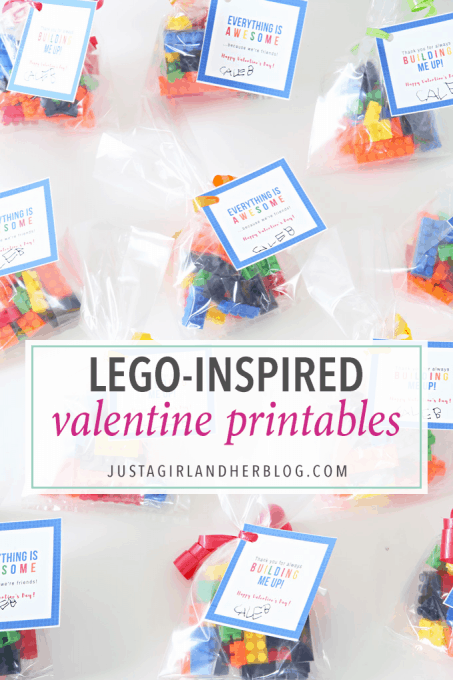 Valentine’s Day is quickly approaching and while some boys enjoy the day (hey free candy right?) most may not be too thrilled that they have to hand out sappy, mushy valentines to everyone in their class, even the girls! It can be a bit of a sappy holiday, especially to a boy. But with a few fun mustaches Valentine’s Day may not be as uncool as most boys think! Mustaches are very popular right now, and little boys think they are hilarious. What is funnier than a little boy with a black handle-bar mustache right? So we have scoped out a few really unique and fun valentines for your boys to make this February 14th. They will love making them, and giving them out! First on the list is this great idea from TheCraftMonkey. All you need is some sticky felt mustaches, your cute little boy, and a camera. Let your little man have some fun posing with his funny little mustache, let him ham it up! Choose the photo with the biggest cheese factor, and take it to be printed to your local photo spot, or at home if you have a photo printer. 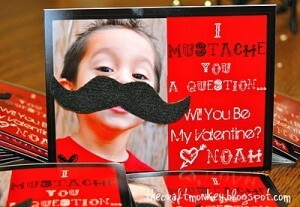 Make a postcard sized card and add a little saying, “I MUSTACHE you a question, will you be my Valentine?” and print. Dot on the felt mustaches and you have an adorable valentine. 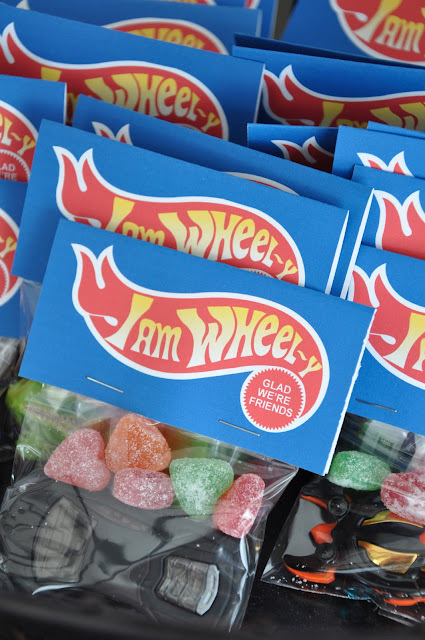 Another great Mustache idea is as sweet as candy. SkipToMyLou has a great example. Simply get some lollipops, any will do but they chose the ever popular tootsie roll pop. 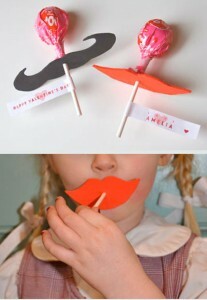 Cut out some mustaches in cardstock, punch a hole for the lollipop, and attach a little note from your little man. Now when his friends eat their lollipop they will have their very own mustaches! Or if you are feeling like baking you can always do cupcakes. I have never known a child to turn down a cupcake. ASpoonfulofSugarDesigns has some incredible looking cupcakes with a great mustache accent. Find your son’s favorite cupcake recipe. Choose some amazing patterned cupcake paper wrappers, icing, some toothpicks, and of course some adorable black mustaches cut from cardstock or construction paper, and get creating! 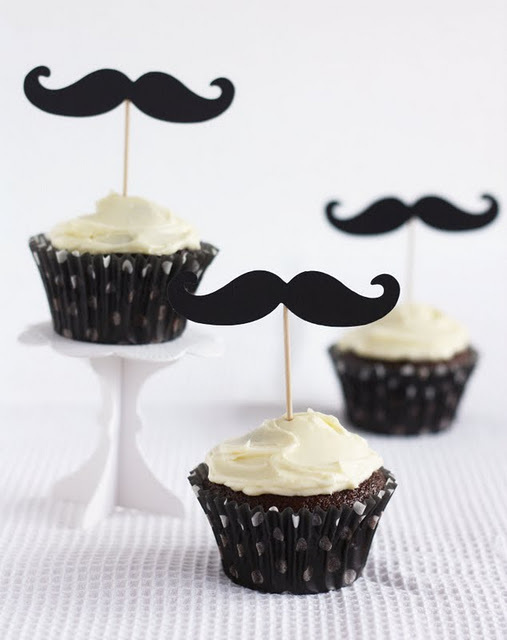 After you are done baking and icing tape the mustaches to the toothpicks and stick them in each cupcake. Now you can even write a little note on the back of the mustache with your son’s name or let him make some cute little cards to go with each cupcake. 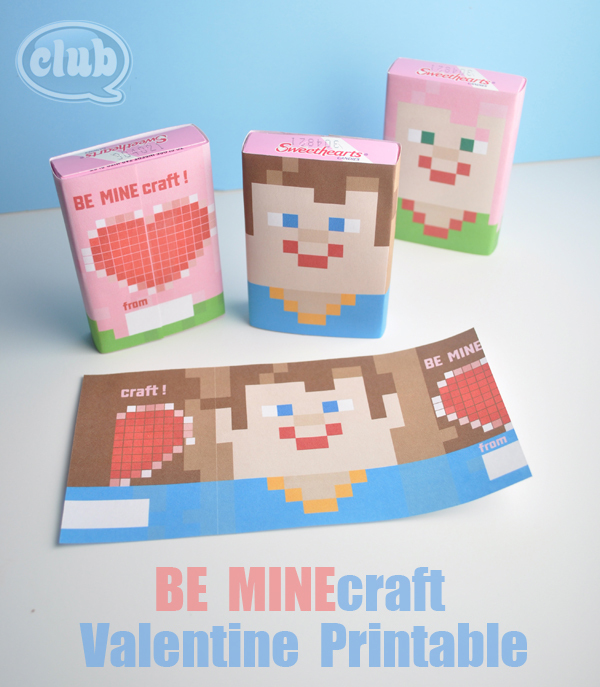 With all these great options you and your son can design together some amazing Valentine’s Day cards. Have fun! This entry was posted in Activities and tagged Activities, Boy Valentines, Holiday, Mustache Valentines, Mustaches, the boys store, Valentine's Day on February 8, 2012 by Lacy.